What one man did to honor the dead is seen by many people as downright disturbing. Dolls hanging from the trees on Isla de las Munecas. A creepy island with its strange collection of hanging dolls and weird mysteries in Mexico is currently a popular tourist spot in the country. 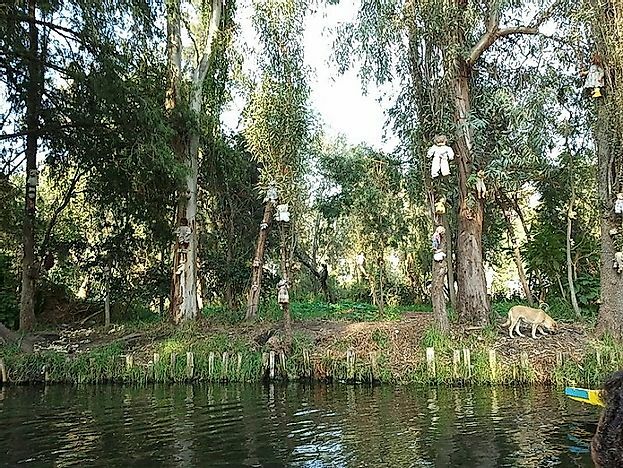 The island, referred to as the “Island of Dolls’ or in local language “Isla de las Munecas”, is located on the Xochimilco canals at a distance of about 28 kilometers from Mexico City. The island can be reached only by a ferry from either Embarcadero Fernando Celada or from Embarcadero Cuemanco. As per the official website of the island, the tradition of hanging dolls in the island was started by a Mexican man, Don Julian Santana, who lived on the island as the caretaker of the place. As per legend, Santana found the floating body of a dead young girl in a canal near the island. The girl appeared to have died of mysterious circumstances and Santana lamented on not being able to rescue the girl. Soon after this discovery, Santana also found a floating doll in the canal which he assumed to belong to the girl. As a tribute to the dead child, he hung up the doll on a tree in the island. Somehow, this single incident soon turned into a passionate habit of Santana and he began collecting and hanging dolls of all shapes and sizes on the island. Locals have often commented on Santana being haunted by the spirit of the dead girl and those who knew him well often spoke of his transformation into a strange man with a weird character. Whatever be the truth, Santana continued to hang dolls all over the island till he too mysteriously died on nearly the same spot where the girl’s body was found. Locals in the region still are afraid of the dolls on the island which according to them is haunted by the spirits of dead girls, talking to each other or luring people to the island. Even though we tend to associate dolls with pretty looks, the dolls in the Island of Dolls are in no way a pleasant sight to watch. Most of these dolls were discarded by their owners, thrown away due to their dismembered figures and spoiled looks. The dolls hung on the island appear quite creepy with some dolls lacking one or more limbs or others with decapitated heads and gouged eyes. Many of the dolls have torn dresses or are completely exposed, have mud, straw, molds covering their surface or have spiders and other insects making their home in their hollow insides. These dolls are strewn all across the island, on trees, fences and all types of surfaces available for hanging them. Locals and tourists both agree on the fact that one look at the island’s dolls is enough to allow shivers run down their spines. Even though prior to Santana’s death, the Island of the Dolls was not well known to public, interest in the island grew with the news of his mysterious death. Soon, the story of Santana and his unique habit spread far and wide and media channels including major news and magazine publications started reporting the strange stories of the island and Santana. Currently, this island is open to visitations by tourists. Tourists visiting the Island of Dolls also often take a boat ride on the Xochimilco canals of Mexico. The boats plying on these waters are usually well decorated with vibrant colors and floral designs with arrangements for music and Mexican food on board. There are also vendors selling colorful artifacts on the canals in boats that are unique to the region.